Before we left for West Virginia, I took a quick peek around Google Maps to see what was around the Romney area. While I don’t usually leave with a set plan of things that I must do I like to have some general idea of sights in the area. I hate coming home and finding out that there was something neat just ’round the corner that I missed out on. In my electronic touring, I noticed that there was a place called Lost City, not far from Romney where we were staying. I made a mental note to try to pass through there. Lost City. That’s a name that can really send your imagination on an adventure of it’s own. 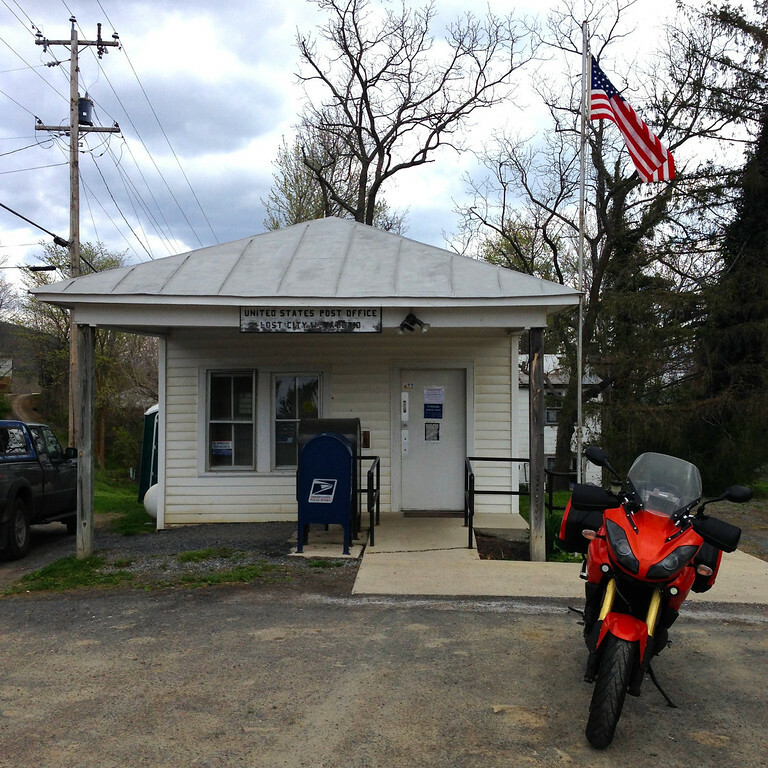 As it turned out, Lost City had a sweet, teeny post office – the kind that I love to find. Love letters, birthday cards, postcards from far away places… those are what I think about when I see these little post offices. They are so much more “real” than some big impersonal behemoth that has machines sifting and sorting. These places have a person who knows everyone who passes through its doors and says g’mornin’ and means it, a clerk who asks about kids by name and wants to know if your great aunt is over her cold yet. The Lost City office is indeed small. Without it’s overhang, I think it might give the Topaz post office a run for it’s little money. But to date, I think that the little Topaz, Ca. post office has to be the smallest I’ve seen so far. I’ll just have to keep looking for something smaller! We don’t have anything like those small Postal offices up here. In smaller communities they put a counter inside of a larger store, or subcontract it out to someone else. They have many small postal outlets in convenience stores but at more reduced hours. So glad you loved the area of Lost City! I invite you to come explore Hardy County further, it is time for the leaves to start changing to their majestic colors and fall from the trees, fall festivals, and pumpkin picking too! COme on back for a revisit to the Lost City Post Office and environs… we just did a make ove of the place. Open Mic night at the Lost River Grill & Hotel September 26, 2014 as part of Hertiage Weekend!! !